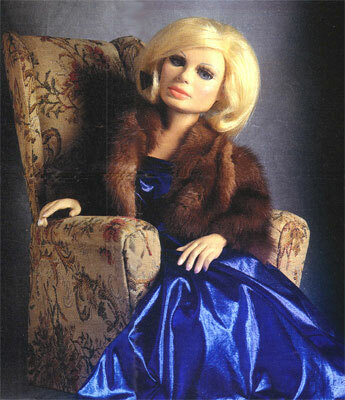 This photograph by Mike Laye accompanied a spoof 'interview' with Lady Penelope by Kate Battersby in the Telegraph Magazine to promote BBC2's re-run of the original 'Thunderbirds' TV series in 1991. A Nationwide manhunt was launched yesterday by friends of a television star who has been missing for 25 years. When last seen in a skip in Slough, Virgil Tracy was wearing his blue uniform and usual Mussolini-style hat. He is described as white, with mousey-dark hair, brown swivelling eyes, bushy eyebrows and a deep tan. Virgil, a qualified pilot, is still aged about 26, 1ft 8in tall and weighing approximately 2lb. A small reward is offered. No strings attached. 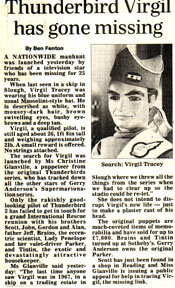 The search for Virgil was launched by Christine Glanville, a puppeteer from the original Thunderbirds series, who has tracked down all the other stars of Gerry Anderson's Supermarionation series. Only the rakishly good-looking pilot of Thunderbird 2 has failed to get in touch for a grand International Rescue reunion with his brothers Scott, John, Gordon and Alan, Father Jeff, Brains, the eccentric scientist, Lady Penelope and her valet-driver Parker and Tintin, the exotic and devastatingly attractive housekeeper. Christine said yesterday "The last time anyone saw Virgil was in 1967, in a skip on a Trading Estate in Slough, where we threw all the things from the series when we had to clear up so the studio could be re-let." 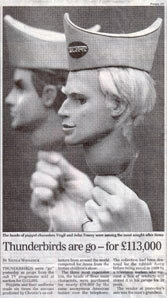 She does not intend to disrupt Virgil's new life - just to make a plaster cast of his head. The original puppets are much coveted items of memorabilia and have sold for up to £7,000. Brains and Tintin turned up at Sotherby's. Gerry Anderson owns the original Parker. Scott has just been found in a shop in Reading and Christine Glanville is issuing a public appeal for help in tracing Virgil, the missing link. Thunderbirds are Go once again. After more than 20 years of separation, Virgil Tracy, the square-jawed and smoulderingly handsome pilot of Thunderbird 2, has been found in an attic in a house in Berkshire. Virgil was last seen in a skip outside the warehouse in Slough where the television series was made. 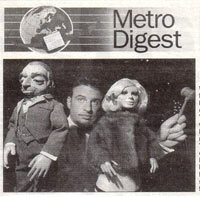 He returned to the fold following an appeal in the Daily Telegraph from one of the puppeteers from the series. Christine Glanville made the appeal because she wanted to exhibit the puppets. Virgil was the last missing cast member. Christine commented "It's wonderful. We have now got all the boys back and we can mount the exhibition." Puppets from the cult TV show Thunderbirds went under the hammer last night. The original chauffeur Parker, was bought by a Middle Eastern Sheikh for £38,000. Thunderbirds were "go" yesterday as props from the cult TV programme sold at auction for £113,000. Puppets and their uniforms made six times the amount predicted by Christie's as collectors from around the world competed for items from the Sixties children's show. The three most expensive lots, the heads of three main characters, were purchased for nearly £70,000 by the same anonymous American bidder over the telephone. The collection had been destined for the rubbish dump before being saved in 1969 by a television worker, who rescued a box of artefacts and stored it in his garage for 30 years. The vendor at yesterday's sale was the man's grandson.